Here are a couple of small bite-sized updates from Japan, suitable for snacking. First, here’s a sprite sheet that NIGORO posted on their La Mulana Wii blog. I dunno, I really like looking at stuff like this. 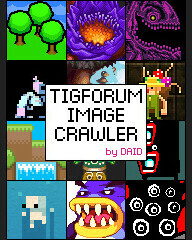 Second, for you Pixel fans: he’s released a tiny new game that you can download from the front page of his website. It’s called Akantares (?) and the goal is to shoot your opponent five times. 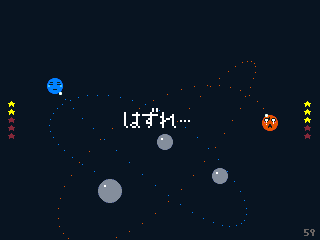 The gray orbs create gravity wells that bend your shots. That’s about it. Update: The lovable, huggable Shih Tzu was kind enough to post a translation in the comments. Apparently, the second window is a lobby that lets you connect to other players via the web. Making this game a lot more interesting, indeed. Okay, that’s it – see ya! A new Pixel game! Yay! Man, I got referenced on the front page. What an honour. Aww, I’m sad now… for a glorious moment I thought “Actions of the Main Character and Akantares” was the title of a game! Menu 1: Enter your name. Menu 2: Lobby. The big white list shows Name and Time for waiting players. The lower-left button is Refresh, and the four buttons on the right are (from the top) Call, Wait, Single Player, and Quit. If you wait, you will apparently show up in the lobby (there must be some central server), because when I tried waiting, in under a minute I was playing against some presumably Japanese person named “kei” (excellent win, kei!). Main Gameplay: Adjust direction with the slider and click the button to fire (you probably figured that out). If you’re playing against another human, you’ll also get Emotion buttons to make different faces at your opponent. And yeah, “Actions of the Main Character and Akantares” would be a great name. Actually, I’ve only been able to connect once, the very first time. Every other time when someone tries to connect to me it just stays on the “Acquiring Coordinates…” screen. Could be a problem on my end, though. I guess Pixel is kind of intimidated by Cave Story’s success. yeah, seems like he’s been mostly working on really small scale projects these days. This game is really boring. Interesting concept, flawed execution imo. I’m sorry, but La Mulana was exceedingly overrated. That game looks almost EXACTLY like Lagrange, an old Game Maker game. @godsavant, falsion, pixel said in interviews that his day job doesn’t leave him with enough time to make big games anymore. Hopefully he’ll make a boatload of cash when cave story is released on wiiware and start working on epic adventure games again.